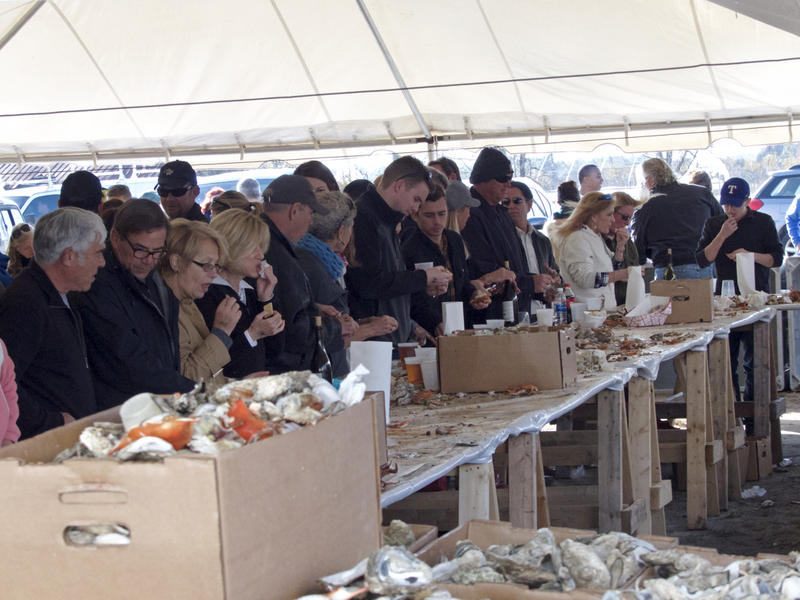 Lined up to shuck oysters and pick crab at the Annual Big Curri-Shuck. The 2016 version of the Annual Big Curri-shuck? Now that was a great party. The premise of Curri-shuck is simple. Gather everyone together the Saturday after Thanksgiving. Give people all they can eat steamed oysters, crab and pulled pork barbecue, have some great local beers on tap, sample wine from Sanctuary Vineyards the host for the event and throw in some really good music. It also helps that the event is really kid friendly with hayrides all day long. Two local businesses really stepped up to put the event together—Sanctuary Vineyards in Jarvisburg, where the event was held and I Got Your Crabs down in Kitty Hawk on the Outer Banks provided the oysters and crabs. As much as it can be, everything is local. Hunter Stuart, who owns I Got Your Crabs is a commercial fisherman, and he is still out on Currituck Sound from time to time, pulling in crab pots. The oysters were definitely from the Southeast. Difficult to know if they were North Carolina oysters, but a lot of them had miniature crabs in them. The crabs are called pea crabs and they find a happy little home inside the oysters, grabbing a little bit of food as the oyster brings water in to filter through its system. They are considered a delicacy, although for anyone who doesn’t know about them and pops open a raw oyster, seeing an itsy bitsy crab scuttle across the oyster can be disconcerting. Of course, the Curri-Shuck oysters were steamed, so no movement from the pea crabs. The presence of the pea crabs, though, means the oysters had to come from North Carolina or a neighboring state; pea crabs only live in the Southeastern US. It was a bit cool when things started—bright sunshine but a brisk north wind kept temperatures down. However, gather about 1000 people together, put them inside a tent and pretty soon things warm up. The music helped too. Croatan Highway and the Dave Cynar Band were fantastic—country with a touch of rock ’n’ roll. Here at Joe Lamb Jr., & Associates. we’re already marking our calendars for next year. Saturday November 25, 2017 looks like it will be the date. Hope to see you there.